I had hoped to launch my KickStarter campaign in mid-April. Looks like a late April launch date though. Thought you would like to see the modbox in Sunflower, hello spring! What do you think? The prototype fabrication finally started this week. Yeah! We also sent the tooling CAD files off for quotes this week. The tooling for the embossment on the side is complicated, and thus expensive! The aluminum flag cap requires a special tool too…still waiting on the tooling cost for that. 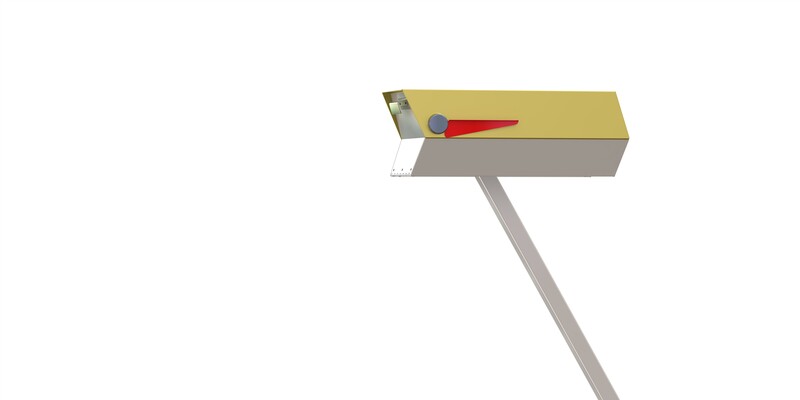 Mid-Century Modern Mailbox Rendering in Sunflower | modbox! With the higher tooling costs, I will need more backers (like you) on my KickStarter campaign. But, so far, folks have been very positive and excited about the modbox…so, I’m hopeful.